Carl Laemmle, the president of the Universal Film Manufacturing Company, landed in New York City in 1884. His wealth consisted mainly in sterling character and unbounded ambition, and faith in the Land of Liberty. He had no money. In the first place, he learned the language of this country while clerking in a drug store in New York. An opportunity of which he took immediate advantage brought him to Chicago. where he secured employment in a department store. The high price paid for labor in the South Dakota harvest fields attracted him, and his $2.75 a day shocking wheat is not one of the least pleasant remembrances of his career. During the panic of 1893 Mr. Laemmie went to Oshkosh as bookkeeper in a retail clothing store and it was only a few years before he became manager of the store. He entered into the social and civic life of Oshkosh as well as into its business life, and there are hundreds of people in this Wisconsin city who remember him for his business ability, his genial personality, and his keen interest in everything which went on about him. After twelve years in Oshkosh, during which time he had saved up a considerable sum of money made from ‘the clothing business, Carl Laemmle came to Chicago with his little pile, to invest in a new line of endeavor: His ambition was a chain of five and ten-cent stores, the idea of a small priced commodity in tremendous quantities having made a very strong appeal to his imagination. As he was looking about Chicago for suitable locations he chanced to see the flamboyant pictures of a moving picture show in operation. The picture show was a novelty to him, as it was to millions of others at that time. He immediately investigated it. This theater was located in the Palmer House block, and was owned and operated by Jones, Linick and Schaeffer. Mr. Laemmle does not remember the name of the theater, but he was so pleased with it, and with the idea of the quick turn over of money to be made in this new business, that he visited it several times. He also went into the only other picture theater in Chicago, the Nickelodeon, on Halsted~ street near Van Buren. His decision to put his money into the film business was made right then and there, and the whole course of his life was changed. He saw the opportunity and grasped it unhesitatingly. In a very short time he had taken a lease on the property located at 909 Milwaukee avenue, remodeled it and opened what was known as the White Front theater, “The coolest 5¢ theater in Chicago.” The opening was on February 24, 1906. The theater contained 214 seats, and was, of course, nothing but a remodeled store. Maurice Fleckles, who later became Mr. Laemmle’s brother-in-law, looked after the remodeling of the theater for him. Later when Mr. Laemmle decided to establish a film exchange of his own, Mr. Fleckles became associated with him, and a little bit later R. H. Cochrane, present vice-president of the Universal, went in with Mr. Laemmle in the exchange, and later in the manufacturing end of the business. This exchange was called the Laemmle Film Service, and was established in October 1, 1906, in the Crilly Building, at Monroe and Dearborn streets. After a few months it moved to 196 West Lake street, where its space was continually enlarged, until its present location was made necessary at 205 West Washington street. The White Front theater was a success from the very start. Walther Johnson, now manager of the Parkway theater in Chicago, was its first manager, although Mr. Laemmle spent as much time at the theater as he could spare from his other duties. This picture of Mr. Laemmle’s first show house was taken on July 24, 1906, one of the hottest days of the year, and shows Mr. Johnson in his shirt sleeves near the entrance. 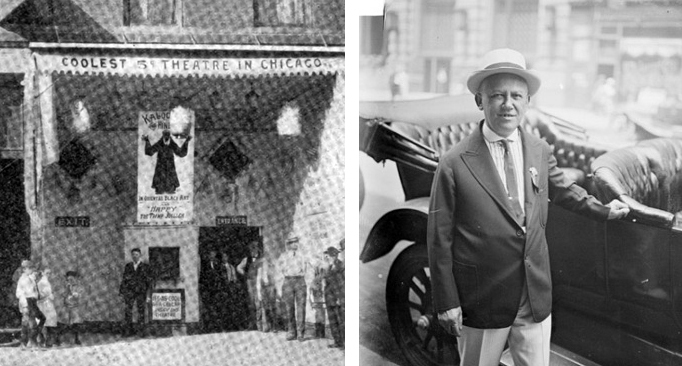 Mr. Laemmle charged 5¢ in his theater, although one other house in Chicago charged 10¢, and made money at it. But Mr. Laemmle was a merchant and a great advertiser. He believed in letting everyone know about what he had to sell, and as in Oshkosh, where he was known as the largest advertiser in the city, the advertising and the five-cent price packed his house all the time. The greatest difficulty which a manager in those days faced was getting any film at all to run. The few exchanges in existence were very independent and could afford to be, though they in turn were dependent on the few manufacturers. To supply the great demand for film now became the dominant factor of Mr. Laemmle’s life, and made him in turn a successful exchange manager and finally president of the largest film manufacturing concern in the universe. Mr. Laemmle’s first show consisted of one reel of film, and that was only 900 feet long. Each show lasted about twenty-two minutes, and included a song besides the 900-foot reel. Under these circumstances, playing to turn-away business, it was possible for the house to clear as high as $192 in one day, and this is the record for the White Front, though business usually ran around $180. Where is there a 214-seat 5¢ theater which can beat that today? Mr. Laemmle also owned another house, having acquired it very soon after the White Front, in April, 1906. This theater seems never to have had a definite name. It was located at 1233 So. Halsted street, and like the White Front, was a converted store show. These were the only two houses in which Mr. Laemmle had any considerable interest, and his interest in them soon became secondary to his exchange, and that in turn to his manufacturing interest in the Independent Movie Pictures (IMP) Company. The property, which had a fifty-foot frontage, could have been bought for $40,000. Since then it has changed hands twice, first for $65,000, then for $85,000, and is now worth $140,000. When Mr. Laemmle’s lease of the theater was up at the end of five years, the proposition of buying the property came up again, but Mr. Fleckles was very much against the proposal, as he had come to the conclusion, and so had Mr. Laemmle, that the small theater was a thing of the past, and that large seating capacity was essential for the success of a theater, at least in such a prominent location as this one had. Also, the rental was so greatly advanced that it would have been highly inadvisable to sign another lease on the new terms. This closed Mr. Laemmle’s active management and ownership of picture theaters. Nice story if it was only accurate enough. I’ve studied the life and times of Carl Laemmle for nearly 40 years. I could give that writer some pointers. I’ve met a number of people who knew him including his own son. Need not argue the accuracy. A true story should be 100% accurate. Don’t know where the writer was getting information? Nice try. This is interesting indeed. While I have not been studying Carl Laemmle for 40 years, I have lived with his memory for all my 56 years. A point unmentioned here is that his other brother-in-law, Julius Stern (Carl married Julius’ sister Recha Stern), managed the White Front, then the Film Exchange, was a key player in the management and growth of IMP and then at Universal. How do I know? Julius Stern was my grandfather.